People often ask us about the best way to clean mold. Mold cleaning is a popular topic these days since we now recognize the many health risks posed by some strains of mold, including black mold, or Stachybotrys atra. There are about 100 types of mold commonly found indoors in the U.S., though. It’s important to remove mold properly to prevent symptoms like respiratory infections, trouble breathing, headaches, depression, trouble concentrating and short-term memory problems. The North Dakota State University suggests scrubbing mold off hard surfaces with a non-ammonia soap and then using a disinfectant on the surface. However, the Environmental Protection Agency recommends people only attempt to clean mold themselves if the mold affects an area of less than ten square feet. They recommend calling in a professional if mold affects an area larger than that. It is sometimes impossible to clean mold from certain surfaces, mainly porous surfaces like carpet, drywall, insulation or ceiling tiles. Those materials often have to be removed and replaced in order to get rid of the mold. It can also be difficult to remove all traces of mold from wooden surfaces, so the North Dakota State University recommends sanding off the visible mold, then disinfecting the surface after sanding it. Again, the EPA recommends only trying that if the mold covers a small area. We think sanding moldy wood is too dangerous for homeowners to attempt, and recommend calling in a mold removal professional if sanding is necessary. There are some difficulties common in mold cleaning jobs. One issue is that scrubbing up mold or handling moldy materials stirs up mold spores and if you inhale them, you can get sick. To protect yourself, you should always wear an N-95 respirator mask when dealing with mold. One reason some people prefer to hire a professional to clean mold in their homes is because professionals know how to do the job safely and have all the necessary protective gear and equipment. 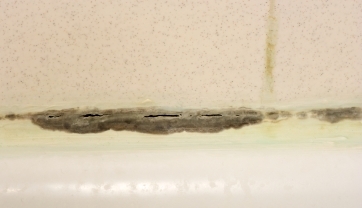 Another problem is that if you see a little mold in one place, there is a pretty good chance you have some mold in other places where you can’t see it. For instance, mold can grow underneath your carpeting. It can grow inside your walls or inside your heating ducts. Even though you can’t see it, it can make you sick. It can be difficult for you to find mold in places like this but you can get a professional to come in and test for mold. He or she will find any hidden mold in your home. If you’d like a list of Professional Mold Testers in your area, just follow the link. While talking about how to best clean mold, it’s important to talk about prevention. Once you’ve dealt with a mold problem, you definitely don’t want it coming back. The first thing you have to do in order to prevent mold from returning is to make sure you get rid of it all to begin with, but there are other steps you should take. Reducing moisture in the environment may be the best thing you can do to prevent mold from growing in your home. If your roof leaks, get it fixed. If you have any leaky pipes, fix those. If water seeps in around any windows, fix them. If you have areas in your home that are typically high in moisture, you can purchase a dehumidifier for those areas. The EPA recommends not putting carpet in areas that have a lot of moisture, like bathrooms, because it is so easy for mold to grow in or under the carpet. And remember, mold cleaning is very difficult with carpeting; usually you have to get all new carpet. Visit your home and inspect the mold problem. Make sure all the mold in the home has been located, including mold in hard-to-see spots like inside your heating, ventilation, and air conditioning ducts. Determine the best methods of removing mold in your situation, which varies depending on the type of mold growing in your home and the types of surfaces on which it is growing. Explain any special safety precautions that should be taken during the mold removal process in order to avoid exposure to mold spores that may be hazardous to your health. Let you know what steps must be taken to prevent future mold growth in the home. Even if you opt to handle the mold removal yourself, you’ll benefit from some free advice from a professional. To find a mold removal specialist in your area, just follow this link.